BAJA's 15th annual "Jazzy Holiday Concert" will take the stage 7:30 p.m. Tuesday, Dec. 11, at Singletary Center. Photo by Phillips Mitchell Photography. LEXINGTON, Ky. (Dec. 10, 2018) — University of Kentucky’s Singletary Center for the Arts will bring jazzy holiday cheer to the stage as it hosts Bluegrass Area Jazz Ambassadors' 15th annual winter concert. “A Jazzy Holiday Concert” will begin 7:30 p.m. Tuesday, Dec. 11, in the Singletary Center Recital Hall. The Bluegrass Area Jazz Ambassadors (BAJA) are a popular performing ensemble affiliated with the Bluegrass Area Jazz Association, a nonprofit organization committed to the promotion of jazz education and the performance of jazz in the Bluegrass area. The group comprises musicians from the community, both professional and amateur, as well as students from Jazz Studies at UK School of Music. The group regularly performs in many places including Singletary Center, Ecton Park and other outdoor festivals, as well as with local middle and high school bands. 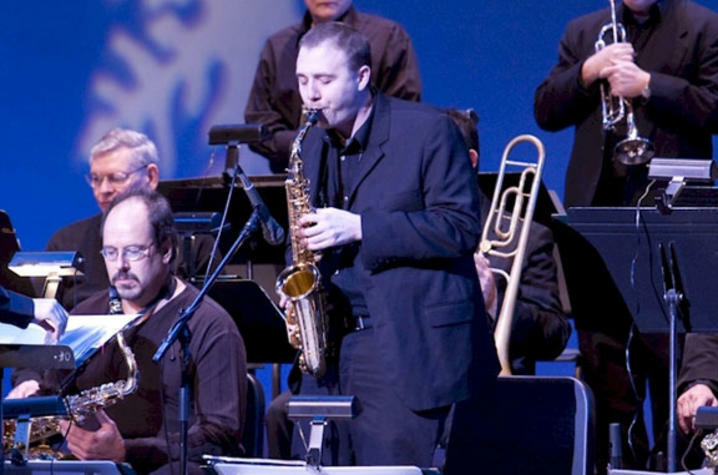 This 23-piece big band, which came together in 2004, performs under the direction of Miles Osland, artistic director. Osland serves on the School of Music faculty at the UK College of Fine Arts, where he is a professor of saxophone and director of UK Jazz Studies. UK alumnus David Hummel serves as musical director for the group. Tickets for "A Jazzy Holiday Concert" are $10.32 for general admission, $3.72 for students, and free for students who pick up tickets before the day of the show at the Singletary Center. Processing fees and sales tax will be added at the time of purchase. To purchase tickets, contact Singletary Center ticket office by phone at 859-257-4929, online at www.scfatickets.com or visit in person.